Big winds today so I decided to stay inside and work the kettlebells with my trainer, Alison Eichten. Mainly worked on core exercises. For instance, take the plank position and then lift and move a kettlebell with one hand while maintaining the plank position with the other hand. Also, burpees with the kettlebell. Then sit on the ground, lift your legs up and haul a kettlebell from your right side to your left and back again. All this strengthens my core which helps me hold myself up on the bike instead of slumping forward on the handle bars. That helps me control the bike better and not get tight shoulders, back, etc. It also wears me out. This entry was posted in Training, Uncategorized and tagged Training Tips. Bookmark the permalink. Hard work! 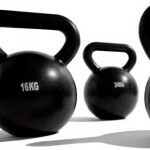 Those Russian kettlebells are awkward, unforgiving hunks of metal. Look forward to following you progress!